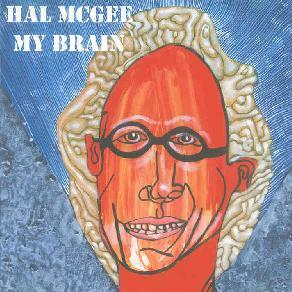 Hal McGee - "My Brain"
Of the many Hal McGee recordings I've heard over the past year and a half, Wired For Sound remains one of my favorites (see AI #19). A non-stop sound art piece detailing his daily life, the album consists of pasted together field recordings, spoken word, and day to day activities that make for a completely non-musical but fascinating sound experience. My Brain comes pretty close to that experience, though it's also one of Hal's most musical, with two lengthy slabs of sound collage that will simultaneously challenge and fry, not the brain of the title, but that of the listener. "Look At The Mess That I Have Made!" is a 31 minute piece with Hal glomming together spoken word, piano and synth noodlings, noise chaos, a banquet of sounds, and percussion from his brother Mark. Early in the recording Hal sets the tone by talking about the trivial sounds of everyday life that we ignore or try to ignore, the flow of consciousness chatter constantly going on in his head, shaping it all into sound forms, and promises a nice big chaotic mess. And Hal delivers on this promise. He brings together a parade of seemingly unrelated sounds... mad concert piano banging, wailing flutes or recorder, fluttering theremin, crashing percussion, efx'd voices, and lots of fun electro craziness. There are some quieter musical moments too where the focus is on the piano and percussion, giving it all a kind of insane asylum orchestral free-improv feel that I enjoyed. The 46 minute "Propagation Disturbation" is similar, including more of the concert piano that we heard on the first track, theremin, alien synth tones, field recordings, spoken word and various other voices. There are some cool musical segments, some of which feature some fiery keyboard work, and combined with all the alien electro shenanigans we get a fairly wild blend. And we also get lots of those trivial everyday sounds that we tend to ignore, though in this context they're prominent amongst the many other layers of sound and therefore available for our consideration. This is abstract stuff and not for the impatient or fidgety listener, who is sure to wind up in a straight-jacket if he or she makes their way through the whole CD. But it's a fun and intriguing voyage for those who are willing to jump aboard Hal's cranium and not get too wrapped up with whether they can dissect or even understand it. It's just the sounds that make the world go ‘round and how it all looks inside Hal's brain.